Not only on earth but Valentine’s Day is also celebrated in space and astronaut Scott Kelly has proved it. All days are good for love and there is no doubt about that. Not only on earth but Valentine’s Day is also celebrated in space and astronaut Scott Kelly has proved it. All days are good for love and there is no doubt about that. February 14 is the day on which we celebrate the love, affection that we hold towards our beloved ones. A US astronaut Scott Kelly posted updates on Twitter from International Space Station how he has been spending his days in zero gravity. 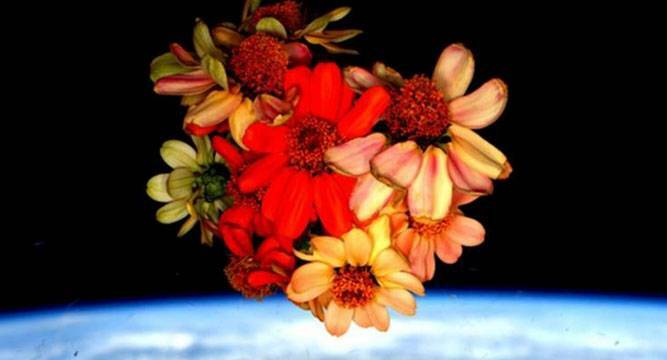 Much to the happiness of earthlings, Kelly posted a picture of a bunch of flowers, which he seems to have gifted the universe on the special day. Before this there have been many pictures shared from Space on Twitter showing the zero gravity atmosphere that have surprised the world from time to time.